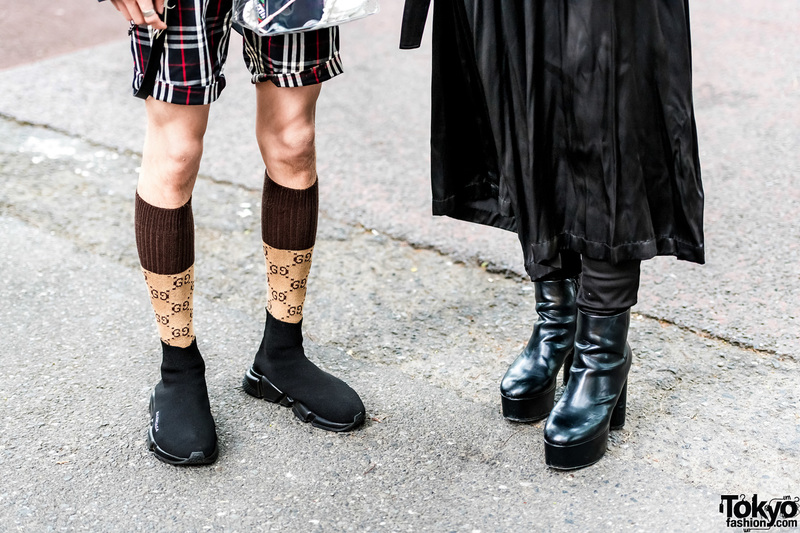 We spotted 20-year-old students Ryuta and Yoko, whose striking black ensembles caught our attention in Harajuku. On the left is Ryuta, who was difficult to miss with his blue hair and printed outfit. 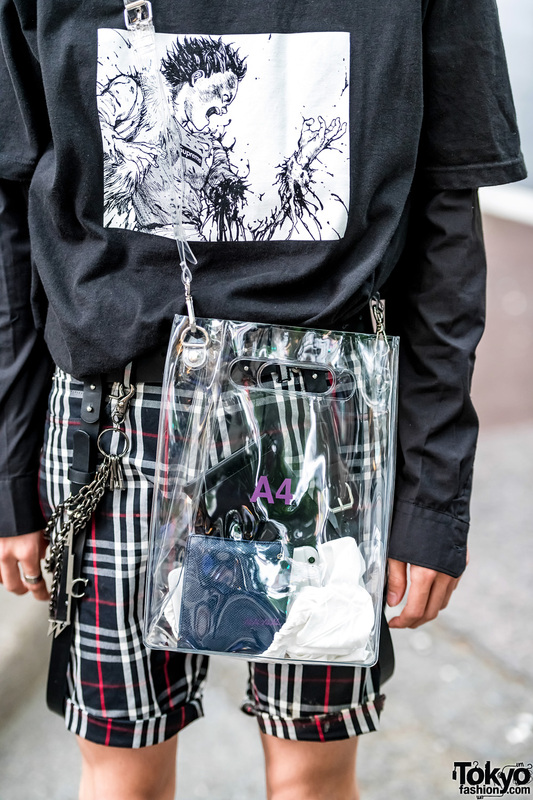 He layered a Supreme x Akira black graphic anime t-shirt over a Supreme black long-sleeved collared top. Ryuta also wore Burberry printed shorts with silver chains attached on the belt loops. He styled them with brown printed socks and black Balenciaga shoes. Round sunglasses, multiple ear piercings, and a clear crossbody bag from NaNa-NaNa completed his look. His accessories are from A.D.S.R. and Gucci. 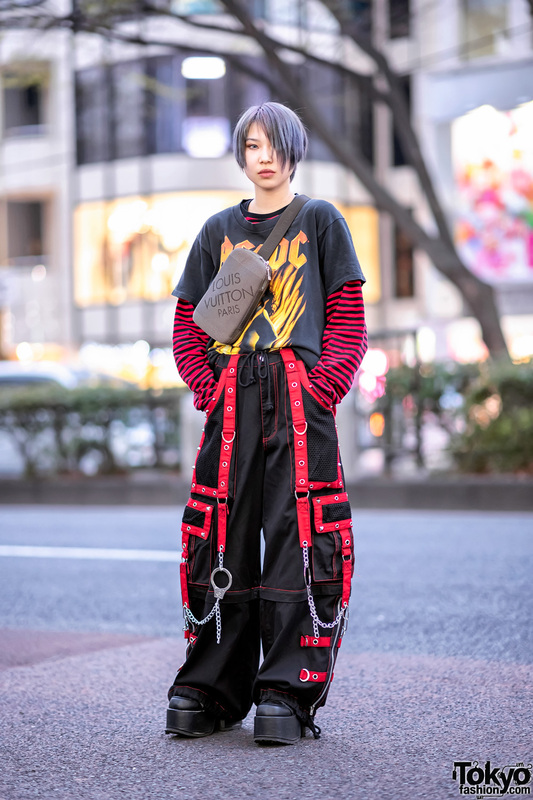 Ryuta enjoys listening to music from Kid Nathan and is also active on Instagram. Next to him is Yoko, who stepped out in an all-black outfit. She donned a collared maxi coat from Y’s, which she wore over a Balenciaga top and cinched on the waist with a Gucci belt. Red lips, a Wacko Maria tote bag, and Emoda black leather platform boots provided the finishing touches to her look. For more on Yoko, follow her on Instagram.